Long ago, there lived three brothers. They had a small firm and little cottage, in which they lived. The eldest brother, Tanyen, worked hard in the firm while his lazy and selfish brothers, Zhoshu and Penhun, ate and slept all day. It was difficult to meet the needs of the family with the meager income that Tanyen said to his brothers, 'It's not possible to carry on like this, brothers! I will go out, seek my fortune, and become rich so I can provide for both of you." Zhoshu and Penhun didn't like the idea. "Why should Tanyen become rich?" they said each other, "We should go out and seek our fortune too!" So, the selfish brothers devised a plan and went to Tanyen. "Brother! I have realized my responsibilities," said Zhoshu. "I will go out, seek my fortune and become rich so I can share your burden." "As you wish, dear Zhoshu!" smiled Tanyen. That day at breakfast, Zhoshu pretended to be very loving and caring. "Eat well, Penhun," he said, "and don't worry; I shall soon return rich!" He then took leave of his brothers and started on his journey. He kept walking throughout the day. By late evening, hungry and tired, he reached another village. He went up to a hut and knocked at the door. An old woman answered, "Who's there?" "I'm a traveler," Zhoshu replied. "Can I stay here for the night?" "Only if you remove all the stars from that pool!" said the old woman, pointing to a pool of water. Zhoshu thought, "How can I remove those stars? They are nothing but a reflection of the sky!" Puzzled and exhausted, he returned home and said to his family, "I couldn't find my fortune anywhere!" Next, Penhun decided to try his luck and left home. Wandering, he too reached the old woman's hut and was asked to fish out the stars from the pool. "How is that possible?" he thought and returned home. "Nowhere could I find my fortune!" he said sadly. Now it was Tenyan's turn. When he reached the old woman's hut, he too was asked to perform the same task. He humbly asked for a bucket, which the old woman gave him. Tanyen waded into the pool and began to throw out bucketfuls of water. He worked hard all night, until the pool was completely dry. In the morning when the old woman came out of her hut, Tanyen showed her the dry pit and said, "I have removed all the stars, O good mother!" The old woman was pleased. She led him to a huge farm and said, "This is your reward. From today, you are the owner of this farm!" Tanyen thanked the old woman and returned home a rich man. "I have found my fortune!" he announced." But where?" asked his brother's. "I found it in my own hands!" replied Tanyen. He then told them all that had happened. 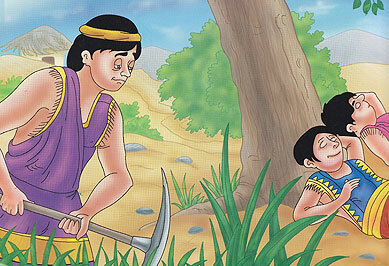 His lazy brothers resolved to work hard from that day. And they lived happily for the rest of their lives.